Another MotoGP race and another record broken by young Marc Marquez. This time the Repsol Honda rider had his work cut out for him, though, despite the fact that he started the race on pole. Dropping down to tenth place after a first lap skirmish, Marquez climbed through the field to win the race and also take home the record for youngest-ever winner of five consecutive premier class grand prix motorcycle wins. That Marquez was going to be strong at Le Mans was never in doubt and when he took to the track for qualifying it was rather predictable that he would claim pole position as well. Which he did - his fifth of the season in as many qualifying sessions. And he'd done it in style, shattering the previous lap record at Le Mans with a time of 1min 32.567secs. When the race started at Le Mans, there were plenty of changes up and down the order as the pack all barrelled into the first chicane. The lead fell to Andrea Dovizioso, who got off to a good start after qualifying on the front row of the grid. The Ducati rider's lead didn't last beyond the first four laps, with Valentino Rossi scything his way past on the fourth lap. Marquez, who had slipped down to 10th place, was busy working his way up the field at this point. It was at the end of the 13th lap that Marquez managed to take what he, and a good measure of Number 93 supporters, believed was rightfully his - the lead at Le Mans. 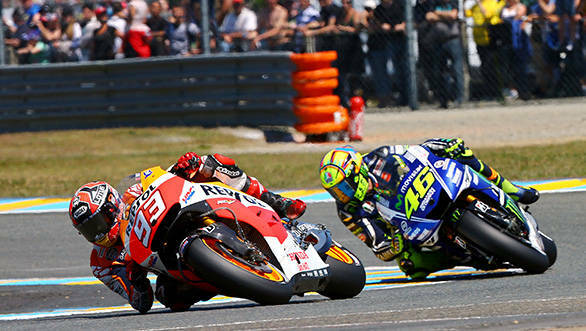 Rossi had run wide, but even if he hadn't it wasn't really likely that he'd have been able to keep Marquez behind him. Rossi finished second, a position that he declared he was happy with, while Alvaro Bautista took home third place on the podium. The man who finished fourth - Monster Yamaha Tech 3 rider Pol Espargaro - was also considerably happy. Espargaro had held on to a podium position for the first half of the race, only losing to Bautista at towards the second half. Behind him, Dani Pedrosa brought home the second of the Hondas, still recovering from arm pump surgery. While Jorge Lorenzo brought the second Yamaha home sixth, ahead of Stefan Bradl who also was recovering from arm pump surgery. Aleix Espargaro was the best Open class rider in ninth, with Bradley Smith finishing tenth.